If it’s ever happened to you, you know the feeling: you open your wallet, reach for the place where you usually keep your card, and… it’s empty. Your heart skips a beat. How could this be? You feel around, double-checking. Still nothing. You empty out your wallet, a mild panic making your pulse dance. Could it really be gone? Where was the last place I used it? You search high and low, turning all of your possessions upside-down and inside-out. But it’s nowhere to be found. Your card is gone. Losing a debit card is an inconvenience and can perhaps put you in a tight spot for a couple of days, especially if you are overseas. But don’t panic! It is not the end of the world. Everything will be okay. Trust me: I’ve lost my debit card twice while living and traveling in Southeast Asia. You’ll figure it out. 2. Report your missing card. Get in touch with your bank as soon as you realize that your card is gone. This is extremely important so that you are not accountable for fraudulent charges made in your name. If possible, check your bank account before calling to verify whether or not any unauthorized charges have already been made. If you have a photocopy of your card, the international collect number you need to call is on the back. You can also find this number on your bank’s website. A) Call using a mobile phone with a Telkomsel/Simpati sim card. If you have access to a stable internet connection, calling with Skype may be a better option. Log into your account and call the bank’s number using + (country code) (area code) (phone number). The phone call will be free–meaning you do not need Skype phone credit–if the number you are calling accepts collect calls. Whether you call from a mobile phone or with Skype, notify the bank representative that you are calling from Indonesia and that the call may be dropped. Provide them with a way to reach you in case you are not able to complete the call. 3. Request a new card. After you report your card as missing, your bank will want to issue you a new card. You will need to provide an address within Indonesia where you can receive the card, which is typically shipped using FedEx. This address should NOT be a personal residence; a hotel, school, or business is a better bet. Be sure to notify the appropriate people at this address that you are waiting for a very important FedEx package. Use discretion when sharing the contents of the package. Since your bank will ship anywhere in the world for a flat fee (usually $15-25 USD), I would highly recommend that you have the replacement card sent directly to you instead of relying on a friend or family member back home to receive it and re-ship it to you. You will be able to track your card’s journey and your bank will work with you until you receive your replacement card. 4. Gain access to cash. A) Use another debit card. If you, being the savvy traveler you are, have a backup debit card then you’re set! Be sure that you have an active travel alert for that card so that you have uninterrupted service at the ATM. B) Get a cash advance on your credit card. If you lost your debit card but you still have a credit card, there is still hope for you! Many banks allow credit card holders to withdraw cash from ATMs using their credit card. This is called a cash advance. Cash advances incur significant fees and should only be used in an emergency. But if you are stuck in Indonesia with no money, I’d say that’s an emergency. Just pay the fees and live frugally until your new debit card arrives. C) Have money wired to you. You can set up a wire transfer either with your own bank using funds from your account or you can call on the assistance of a friend or family member back home to send money to you. Firms such as Western Union have branches all over the world, so chances are high that no matter where you are in the archipelago you can probably arrange a cash pick-up at a Western Union location near you. Service fees vary and this is an option that you will probably want to use only once, if at all. Remember to keep any cash received from a wire transfer in a secure location. D) Borrow money from a local friend or travel companion. This option completely depends on how comfortable you feel asking for favors from the people around you. 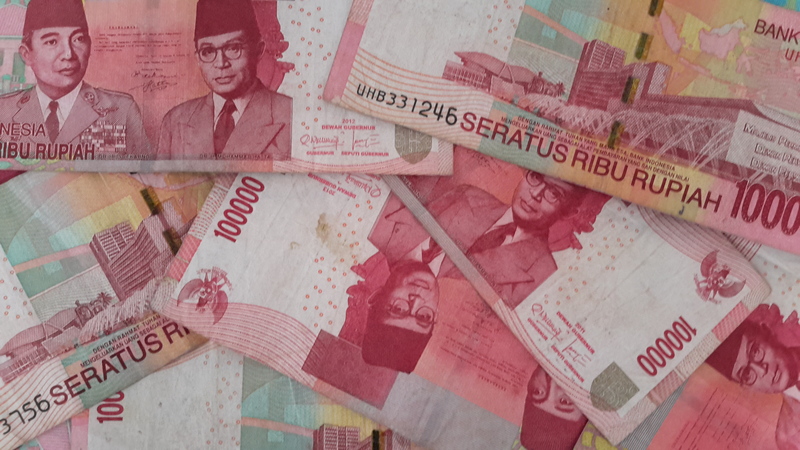 Keep in mind that the average Indonesian’s salary is a fraction of what people in similar professions make in other countries such as the U.S. Be mindful when asking local people to borrow money as a loan of a couple hundred USD is not something most Indonesians can easily afford to do. 5. Wait for your new card. Relax and breathe! You have some money so you can still eat and get a roof over your head. You are safe from fraud, and your new card is on the way. This has been a big headache but it is not the end of the world. Be patient and monitor your card’s tracking number. Note that if FedEx is not able to deliver your package to the address provided, the package will likely be left at the local post office. If you know your package is already in Indonesia but you are wondering why it hasn’t shown up at your door, check at the nearest post office before contacting your bank. 6. Activate your new card. Finally! You have your hands on that full-size FedEx envelope. You can almost smell the freshly printed piece of plastic inside. You tear open the cardboard envelope and the smaller paper envelope inside, digging through the paperwork when… AT LAST!… your hands find that slim piece of plastic that smooths every step of your travels. Just one more phone call to make and this whole ordeal will be a funny story to tell friends over drinks someday. Call the activation hotline that is on the sticker on the front of your card using one of the options outlined in Step 2. Crisis: overcome! As the saying goes: an ounce of prevention is worth a pound of cure. As a traveler who has racked up thousands of miles on public transport across Southeast Asia, who has lost two debit cards and who has also had all of her wired money stolen after losing her first debit card, I have learned a few lessons. Learn from my mistakes so that you won’t need to use the guide above. 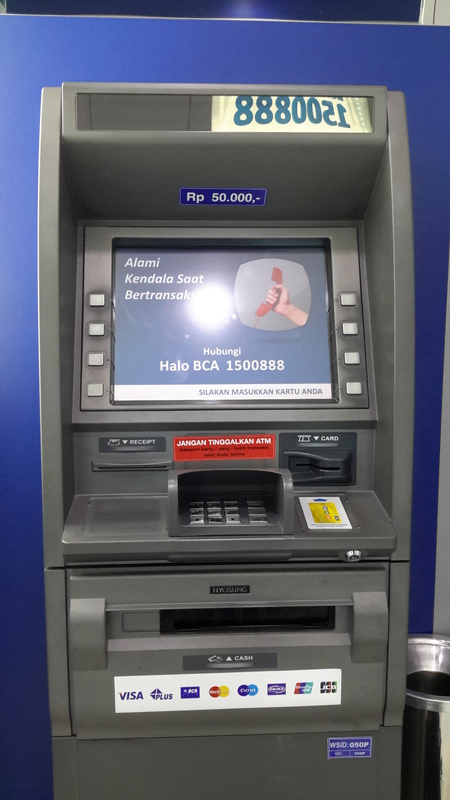 Remember that most ATMs in Indonesia first give you your money, then your receipt, and then your debit card. No matter how much of a rush you’re in, always double-check that you have your debit card before leaving the ATM. This is how I lost my debit card both times. Make multiple copies of your debit/credit cards, passport, and other important documents. Keep them in a secure location while you travel. Leave extra copies at home with a trusted friend or relative. Bring a backup debit card with you to Indonesia. This will ease most of your headaches if you lose your primary debit card because you will still have ready access to cash without paying fees for a wire transfer or cash advance. Add a trusted friend or relative to your bank account before you travel so that they can make calls concerning your account on your behalf. Carry only what you need in your wallet. Your train pass from back home, library card, two extra credit cards? If you don’t need it for your day-to-day life in Indonesia, leave it in a secure location. This will lessen your headache if your entire wallet is stolen. Keep a cash stash in a secure location in case of emergency. A minimum of 1,000,000 IDR (~$70 USD) should be able to get you out of a pinch if necessary. Remember that investing in a small luggage lock can go a long way in preventing petty thefts of opportunity. Carefully consider what kind of credit or debit card you will bring to Indonesia. The Charles Schwab Bank High Yield Investor Checking account has no ATM or foreign transaction fees. The Chase Sapphire and Bank of America Travel Rewards credit cards have nice perks for travelers. Do your own research and consider if opening a new bank account will be worth it for your time overseas. Kelly Fitzgerald is a second-year Fulbright English Teaching Assistant (ETA) living in Sidoarjo, East Java. She spent her first grant in Pangkal Pinang, the capital of the beautiful but lesser-known province of Bangka-Belitung. When she is not busy teaching or recovering from lost debit cards, she enjoys learning Indonesian pop songs, drinking excessive amounts of coffee, and exploring Sidoarjo and Surabaya from the back of a Gojek. You can read more about her travels at https://whereintheworldiskelly.com/. She would like to note that this post is unsponsored and the brands mentioned here are recommended based on personal experience. ← You think that’s fun? Thanks for your comment! We hope it was easy for you to recover your lost card.